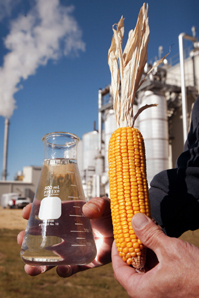 Can ethanol satisfy America's thirst for foreign oil? Energy companies across the Midwest are building new plants to convert locally grown corn into ethanol. The construction spurt is the most visible evidence of expanded interest in renewable fuels, which politicians increasingly believe can begin to wean America from its voracious appetite for foreign oil. Ethanol, the only renewable fuel being produced in the United States in any significant quantity, is being aggressively promoted as a key ingredient in the quest for energy security. But before competing head-to-head with gasoline, it will have to overcome major hurdles. Not only is it more expensive to produce, but some studies say it takes more energy to process corn into ethanol than the fuel delivers. Experts believe a more viable long-term ethanol source could be switchgrass or other so-called cellulosic biomass. The current biofuels boom also bodes well for other renewables, including biodiesel, which has achieved popularity in Europe.